We’ve been invited to a stout and porter fest on Saturday. The hosts are very serious about beer and I thought it might be fun to bake something that would pair well with the beers. I have a recipe for a chocolate stout bundt cake with a whiskey Bailey’s glaze (from Baked Occasions) but bundt cakes are not my favorite to make with my finicky oven. Any other ideas for desserts to make? Bonus if they actually include beer in them… And the boozier the better for this crowd, I think. Tiramisu of some sort is exactly what came to my mind immediately. I might make a test run first if you have time. F&W’s recipes are usually pretty solid, but I would cut down on the amount of stout or just start with less at first and see if you like the flavors together and think it’s the right strength. I could also envision a little Kahlua added in as well. Brownies! I love these cocoa brownies, and they’re always a hit at parties (cut them small - they’re rich). I skip the nuts. I feel that Banoffee can be a good match. I don’t drink stouts and porters - so take this suggestion with that in mind - but I feel like pears would pair (haha) very well. After a big meal of drinking and eating - something as simple as a poached pear may be a nice change of pace and poached with cinnamon or ginger or anise would be interesting I think. . . .
That said chocolate is the “go to” pairing IMHO with a Porter. Found this online - if you do this often, maybe some ideas. How about home made ice cream for a stout variant of affogato? Vanilla, chocolate, or mocha would pair well. Chocolate cake topped with a creamy flan and drizzled with dulce de leche. Hi everyone! Thanks so much for the ideas so far. The tiramisu looks so delicious but there is one specialty item I won’t be able to get before Saturday. I love poached pears but I talked to the hosts and they want something chocolatey. So it may be brownies! I have a dark dark brownie recipe with cocoa nibs in them but does anyone have a recipe with beer actually in them? 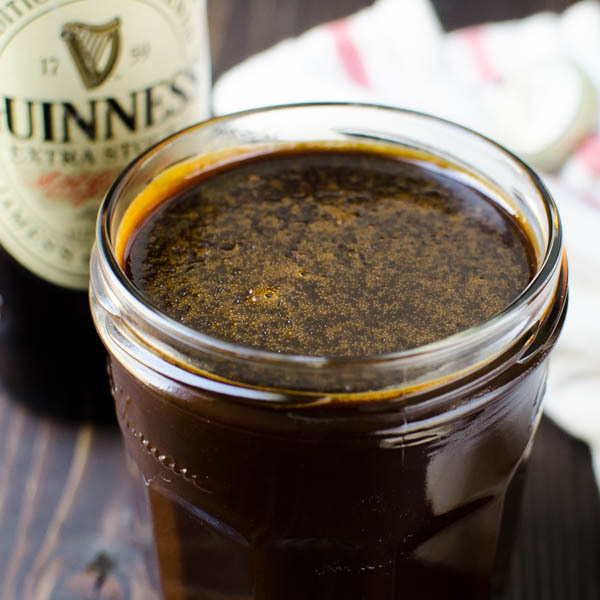 This homemade caramel sauce recipe is perfect for St. Patty's Day because it starts with Irish stout. Deeply rich and nutty, Luscious Stout Caramel Sauce is a delicious ice cream sauce that's easy to make. Ha! when I saw the title I immediately thought of chocolate stout cake. Too bad the host wants chocolate because I thought the vanilla based idea was a good one. Ever have a stout float? I also thought the pear was a good non-chocolate idea. In a way a stout or porter with chocolate is almost too much of a good thing. I have been wondering if a cheesecake would go well. 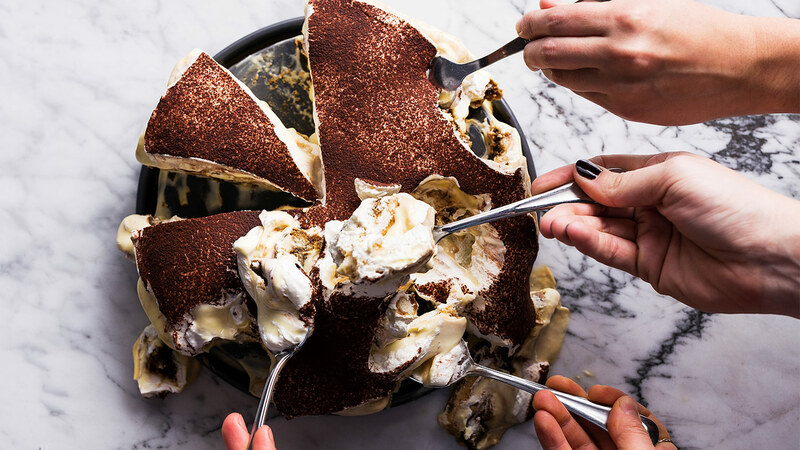 Maybe with that stout caramel but since they want chocolate, the tiramisu would be nice because of the cream layer would lighten and sweeten things up. That being said, I have never seen someone to down a brownie. Travels well too. 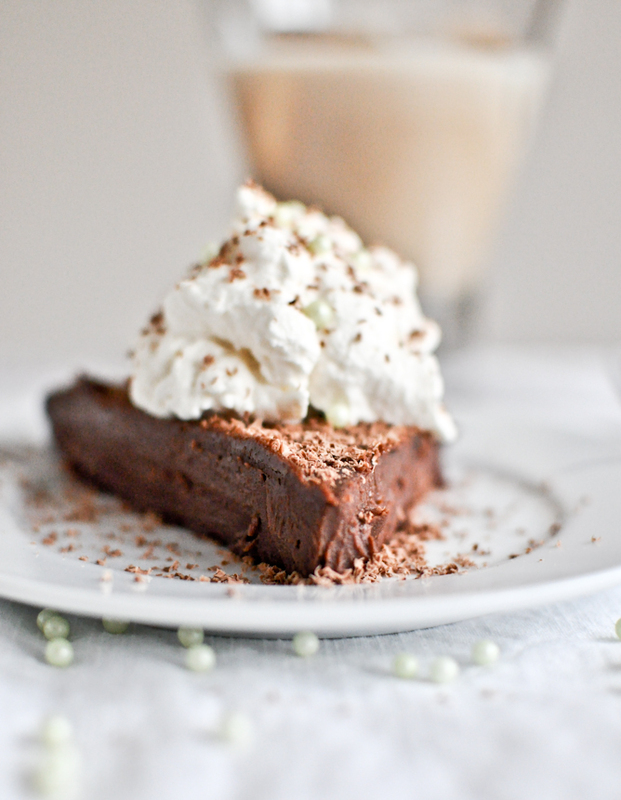 How about a mostly flourless chocolate torte with hazelnuts in the crust? Should play well with the flavors. I would avoid sweet on sweet as it can be too cloying with dark beers. None of the brownie recipes I use have liquid that could be substituted by beer, but here’s one from epicurious. Or make your chocolate stout cake recipe in a regular cake pan (or two, layer with ganache) instead of a bundt, since you’re already comfortable with the recipe itself. I’d just be careful about too-sweet things that might kill the flavor of the accompanying beer. Second the suggestion, but…I would buy a big tub of delicious vanilla ice cream and make a batch of this topping. Easy peasy. 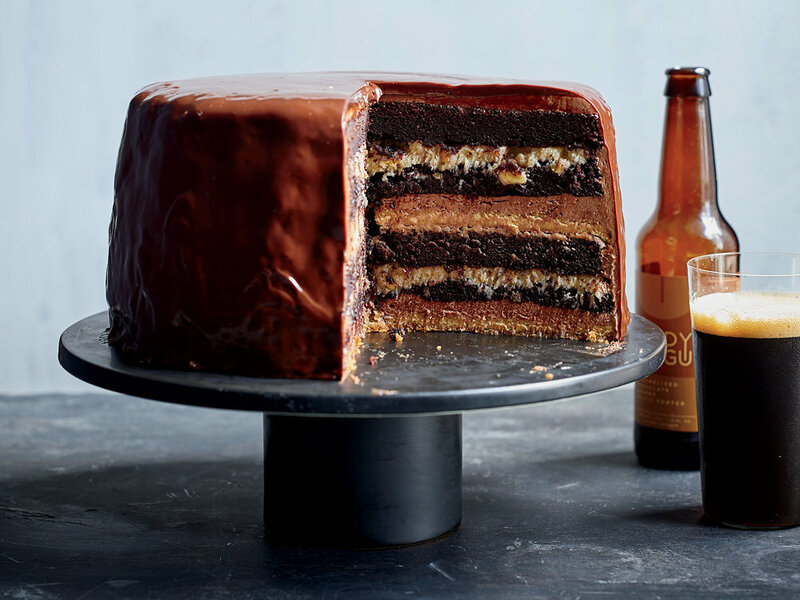 This 12-layer German chocolate cake is served at Moody Tongue to pair with stouts and porters. 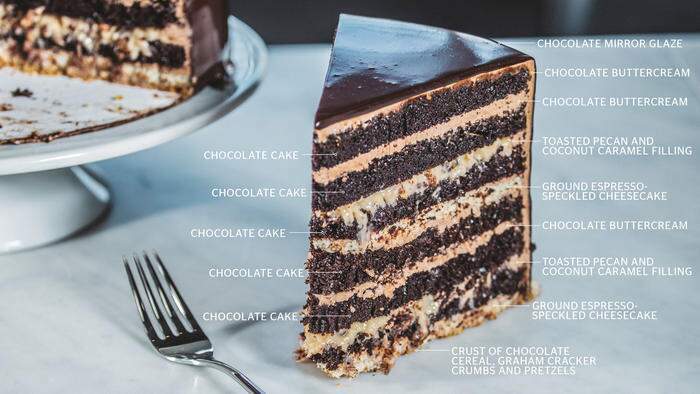 Moody Tongue Brewing Company's Pilsen tasting room is now open, and here's the deal with the 12-layer German chocolate cake. The original name of the German cake is Schichttorte. This epic chocolate layer cake easily serves 25 people and is worth every effort. Get the recipe at Food & Wine. Another recipe proposed by Tasting Menu. We're swapping Moody Tongue Brewing Company's Caramelized Chocolate Churro Baltic Porter in place of rum in this rich tiramisu. Thanks everyone for the ideas. I went with the brownie idea. You all reminded me of a dark dark chocolatey recipe I have for brownies with cocoa, very dark chunks, and cacao nibs. They were a huge hit and paired well with the beers, I thought, since they aren’t too sweet. My favorite beer was a stout with pistachio, a collaboration from Decadent and Evil Twin. The weather was verrrrrry warm for stouts and porters (and the chili and other heavy food served) but it was still a fun time!